Surrounded by the clear blue-green waters of the Gulf of Siam, the island of Koh Samui is part of an archipelago off Thailand’s east coast. Only 45 minutes by air from Bangkok, it is easily accessible, yet firmly maintains it’s away from it all charm. White sand, swaying coconut palms and calm waters are emblematic of this quiet, peaceful refuge. Four Seasons Resort Koh Samui nestles on the north western tip of the island on peaceful Laem Yai Bay – 30 minutes from the airport and just five minutes from the capital of Nathon. Four Seasons Resort is a gourmet paradise, where abundant varieties of fish and exotic herbs are coupled with Thailand’s sophisticated culinary traditions. 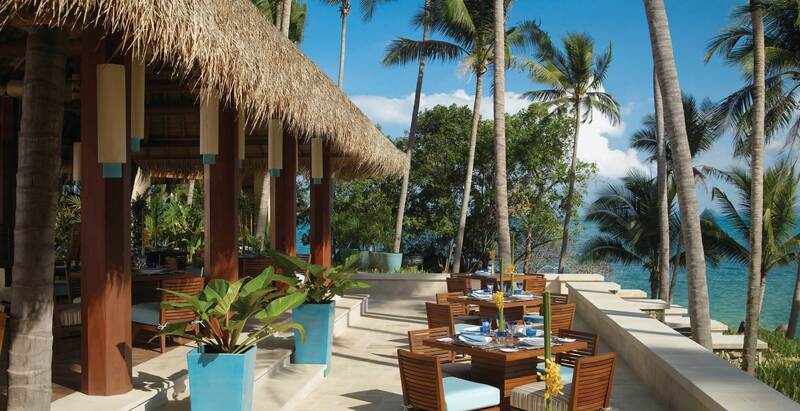 Superbly located at the very top of the resort with a terrace cooled by gentle breezes, Lan Tania offers guests breath taking views of the Gulf of Siam and surrounding islands while dining on the restaurant’s Thai and Italian specialties. Situated on the beach below, Pla Pla has a menu which includes authentically prepared local dishes with meat and vegetarian options, a comprehensive seafood selection together with fresh fish caught daily. There is a myriad of activities to experience around the resort from petanque using coconuts, volleyball and soccer on the beach, to hobie cats, kayaks and snorkelling in the water. Take a garden tour with the chief gardener or learn the art of food carving, Thai people believe that food should also please the eye. The resorts two pleasure cruises offer a great way to experience a day out with family or friends, a sunset champagne cruise with a loved one or a trip over to the neighbouring island of Koh Phangan. Little guests will have a great time at the Kid’s Club where the Kids for All Seasons offers fun activities such as sandcastle building or movie and cartoon shows complete with popcorn. The Spa at Four Seasons, Koh Samui set amid the gentle sights and sounds of the jungle, far from hectic urban life, is a place to experience a delicate balance of refreshment for mind, body and beauty. The Spa’s nurturing treatments rely on centuries-old healing techniques and herbal and holistic remedies deeply rooted in Thailand’s rich spa heritage. Massages, body and facial treatments, together with signature element rituals all combine to create a feeling of wellbeing and rejuvenation. 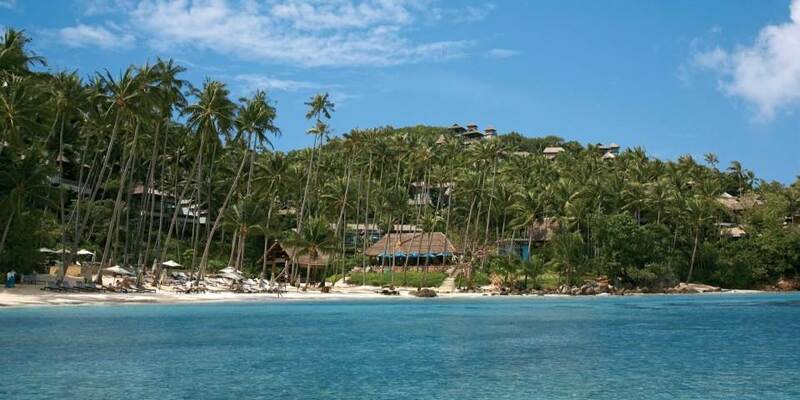 73 villas and Private Residences are scattered around the resort and have amazing panoramas of Laem Yai Bay. Whether beachfront or on the hillside they all offer chic living where the al fresco space comes complete with a private infinity pool. 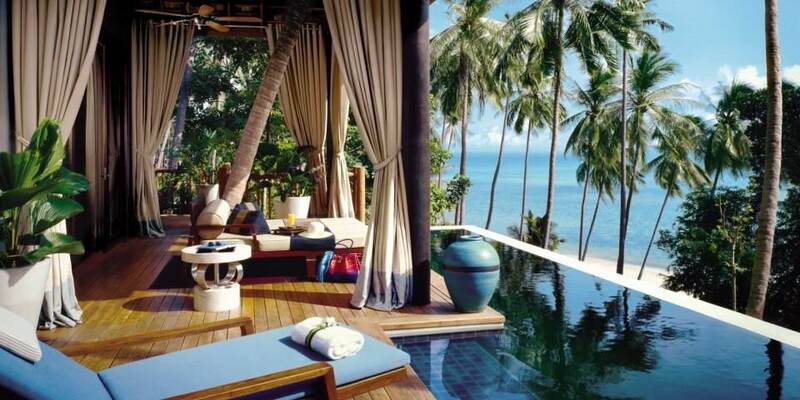 Colour schemes of turquoise blue or sea foam green complement the villas' contemporary, southern Thai-style interiors. Teak and tropical rosewood furnishings lend a rustic feel, accented with Thai silk accessories and custom-made artwork. Bedrooms are air conditioned and separated from the outdoor living area by sliding glass doors; they have every amenity including LCD flat-screen television, an iPod docking station, an alcove with writing desk, a multi-line telephone, and wired and wireless high-speed Internet access. Lavish bathrooms have shell shaped bathtubs and separate glass walled showers. For families or groups of friends travelling together, the Family Villa or Private Residences will be perfect. Ranging from one to five bedrooms, most with two infinity pools these Residences offer exceptional luxury and privacy with the stay enhanced by the services of a mae baan or live in housekeeper.